Robert L. Mosley obtained his love for airplanes and his keen desire to become a pilot from his older brother Zack Mosley. Zack took his kid brother Bob on his first airplane ride and when Bob was 15, Zack began giving him flying lessons. Bob kept airplanes and flying foremost in his mind while attending high school in Oklahoma City. Bob rode his bicycle out to the Oklahoma City Airport every chance he had until he graduated high school and went on to college. WW-II was accelerating in the western Pacific and Europe and was taking most of the eligible men off to the War. By attending college Bob was qualified for the Air Force pilot program which at the time required completion of two years of college. After earning his wings Bob was trained for combat and sent to the South Pacific to participate in the eradication of Japanese from the Islands. Bob flew an aircraft he had fallen in love with on his first flight. The "wonderful A-20 Havoc single-piloted attack bomber", to put the event in Bob's own words. Bob flew combat missions in the New Guinea campaign until General MacArther returned to the Philippines and his A-20 squadron joined the combat operations there. Fl;ying the A-20 against ground and sea targets was exciting and downright enjoyable for Bob and members of his squadron. 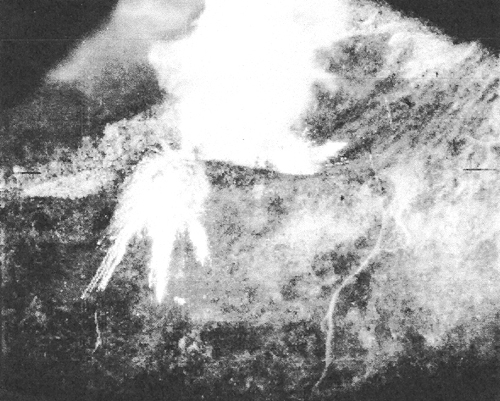 Some flights used for finishing the Japanese resistance on the main island included napalm as seen in the below photo from the aft camera. 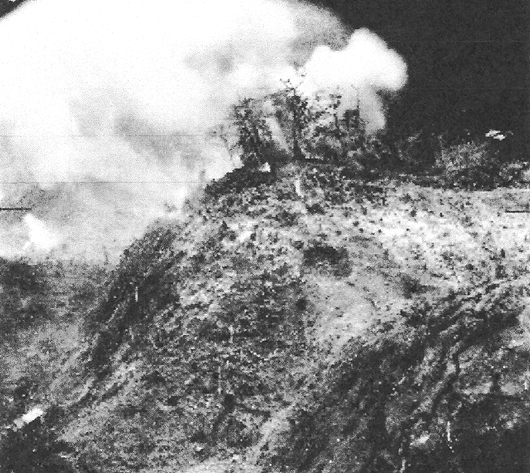 Low-level bombing of the ridges with the many caves and Japanese trenches seen in the below photograph provided opportunities for pilots to fly into trees and debris lurking in the smoke from continuous strikes at the enemy positions. Then there were the attacks on Japanese shipping as seen from the aft camera on the A-20 Havoc. Multiple low-level runs were made on the doomed ship as it absorbed the bomb blasts from the A-20s. 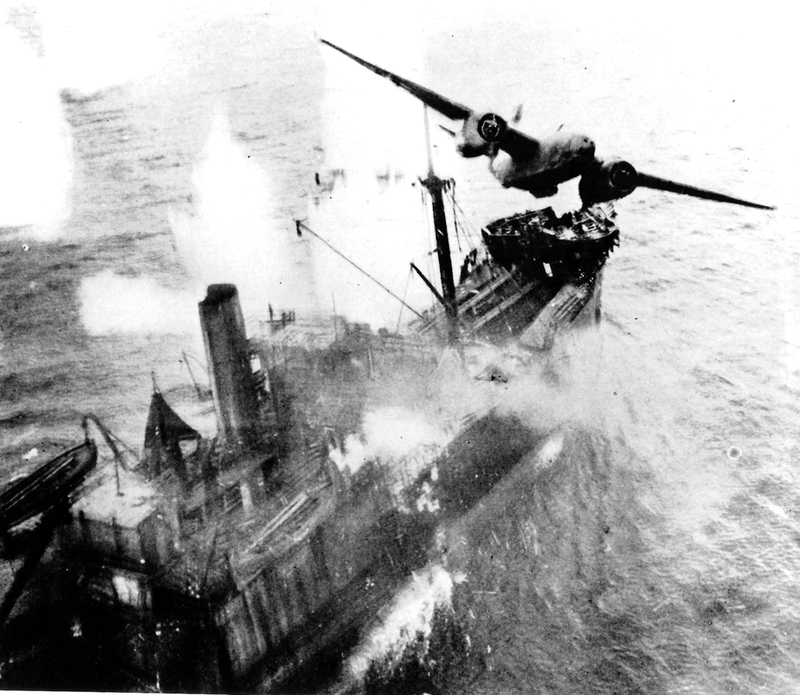 The A-20 pilot in this high action photo was John Soloc who took away part of the ship's log in the nacelle of one of his engines. 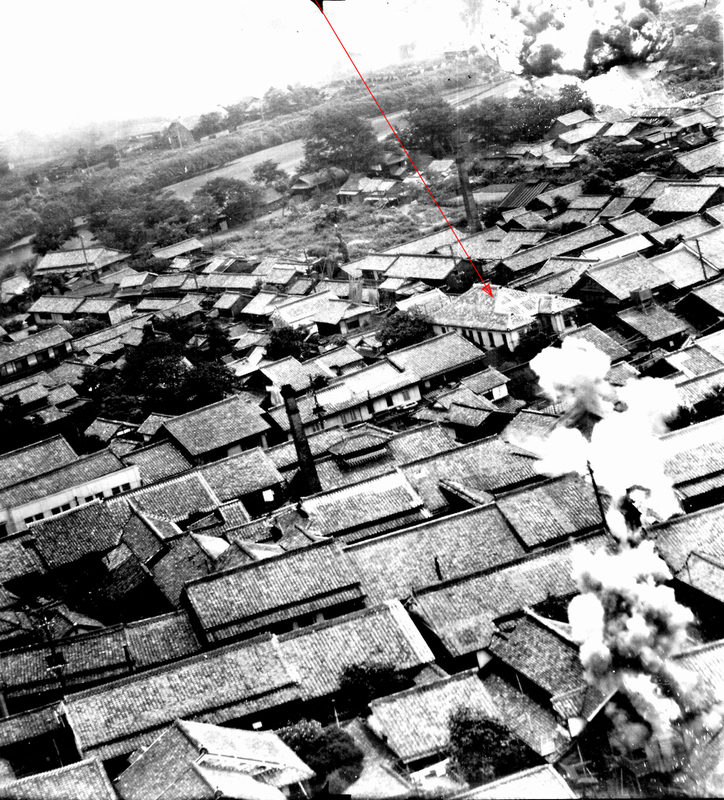 The log was in the debris thrown into the air from the bombs of Rod Vuchilic's A-20 just ahead who also took the picture. Bob wasn't flying all the time. When not airborne the excitement of danger still existed. Danger was always there as Bob relates from one day in the Philippines. "P-38s were the fighters that zoomed and roared all over the skies above the reoccupied American positions. You could tell a difference between the sounds of the zeros compared to the P-38s. The Zero airplanes always sounded to me like the engine had a knock in it. I was outside the hootch once when I heard Zeros coming. There were two of them. They were single engine fighters and were only about 1000 feet above the ground. I could see them very clearly. There was no air raid alert of any kind given at the time. The P-38s were buzzing around all over the place except they were up about 3000 feet higher than the Zeros. Those Jap planes flew right under them totally undeterred in their mission and we put up no ground fire of any kind. It was sort of like a mini-mini Pearl Harbor. It appeared that all the Americans were asleep, yet it was probably 10 o'clock in the morning. I can't imagine how they came in unnoticed but they did! Those two planes flew right over my head in a southeast direction out over the beach. I had to run a short distance through some palm trees to get a view from the beach and by the time I got out to where I could see them, one had dived into a Navy ship of some kind and blown it up. (I guess it was blown up because it was all ablaze) And so help me, the other Zero pilot either lost his nerve or was supposed to report back or something because he retraced his flight path right back across our area and disappeared over the horizon totally unscathed. What made it even funnier, or pathetic I suppose, was that sometime after the Zero 'kamikazied' the ship and the returning Zero was about over my head, the local air raid warnings began wailing. I will never forget the sight as the P-38s headed out in the direction of the burning ship, going southeast, while the Jap fighter with his knocking engine, was right over me heading North (back to Clark Field, I suppose) as fast as he could go. He was probably laughing at the stupid Americans (Pearl Harbor deja vu)." Another exciting day was when the new A-26 Invader aircraft arrived in the Philippines to replace the A-20 Havocs. The new A-26 was a big brother to the A-20 and Bob was given one of them. Bob received five instructional landings from his commanding officer who had just gotten five practice landings from the flight leader who flew the new A-26 aircraft into the Philippines. Then Bob was on his first combat mission to strafe a large Japanese occupied city on the island of Formosa. Bob said he was still trying to figure out how to operate all of the switches for the 14 forward firing .50 caliber machine guns (8 in the nose and 6 in the wings). Below are aft camera shot of hits on a factory and on a rail system on Formosa. 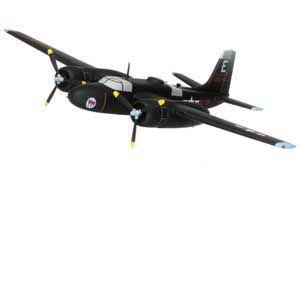 The remainder of Bob's combat flying was in the A-26 Invader for a total of 53 missions. 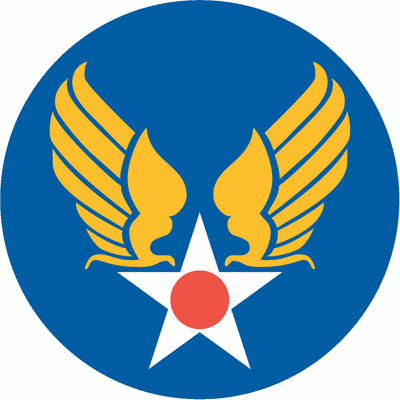 Several combat missions toward the end of the War were in Japan. Bob flew one bombing mission to the Japanese Naval Training Center at Iwakuni, Japan. One of Bob's last missions was on the same day as the Atomic Bombing of Nagasaki. The target was on the Island of Kyushu and only about 75 miles to the south of Nagasaki. Bob is still amazed that the Air Force did not stand down the missions to Kyushu Island on the day of the Nagasaki nuclear attack. 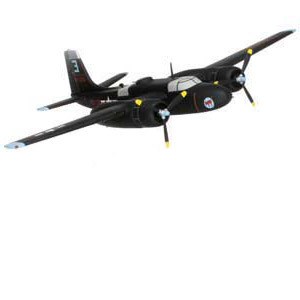 Not one word was mentioned at the mission briefing the night before about our A-26s going to be bombing and strafing at the same time and in the same general area where an Atomic Bomb was being dropped. Secrecy was paramount even though Hiroshima had been nuked three days before. The missions into Japan gave no regard for civilians being in the line of fire or in danger of casualties. The policy apparently was that no inhabitants friendly toward America resided in Japan. 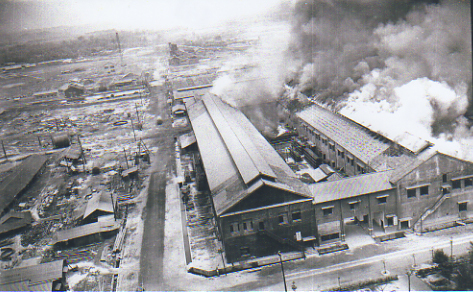 The below mission illustrates how Bob's bombs narrowly missed a hospital in Kumamoto, Kyushu, Japan. In response to the Pearl Harbor unprovoked attack, Bob was proud for having shouted "Take that!" as he bombed and strafed Japanese targets. The Big War was over shortly after the Atomic Bombs hit Hiroshima and Nagasaki. Bob returned to his home in the United States and took on the job as his brother Zack's assistant artist on his comic strip "Smilin' Jack." 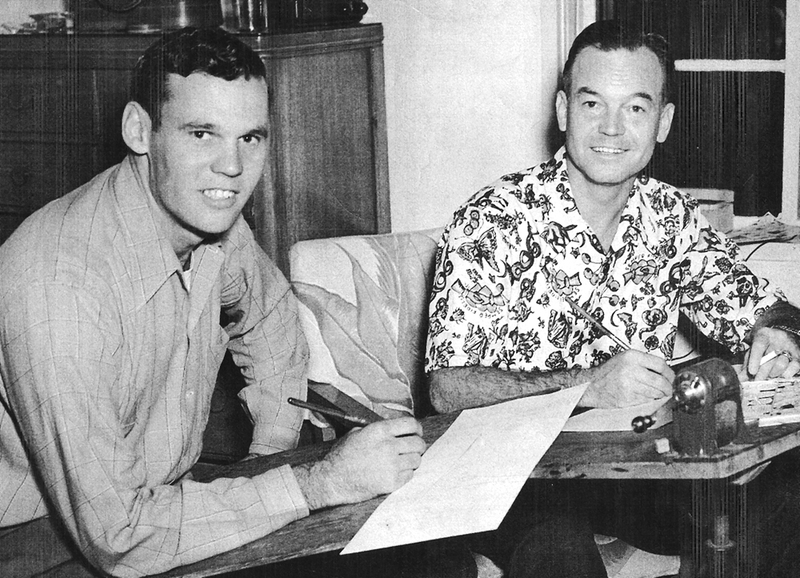 Bob is shown with Zack at his desk where they produced "Smilin' Jack" and all the characters in Zack's adventurous flying production.